While ambiance is not everything, it's always welcome, especially when not expected. 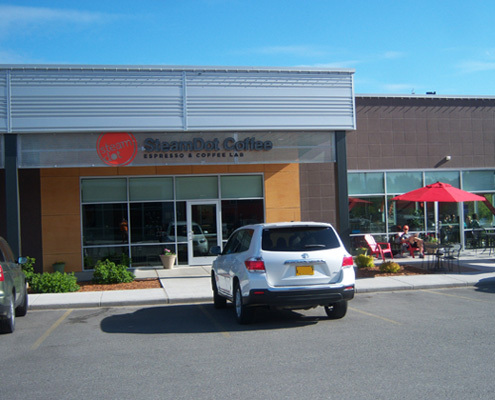 One of my earlier stops in Alaska was a place in the southern portion of Anchorage called SteamDot. 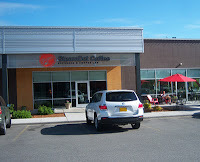 A coffee roaster that popped up in some of my initial searches, SteamDot appeared to be a good stop. My arrival at their sharply decorated store, a cafe full of large windows, bright colors and snazzy furniture, seemed to re-convey confidence that this coffeehouse was no dud (albeit purely based on the notion that if you have a stellar design, you must have amazing coffee to pay for it). Moving onto the coffee, I ordered an espresso of their Single Origin Brazil and a pourover of the Nicaragua. Watching the process of concocting my drinks, they really seemed to know their away around their classy-looking pourovers and the espresso machine, another sign that usually the coffee has promise. But in tasting my drinks, I found both coffees to be a little too dark to be truly pleasant. The espresso, pulled short with a blond crema, tasted of vanilla, ginger and a little nut, yet all amidst a noticeable bitterness like overly steeped black tea as well as a noticeable burnt flavor. The pourover of the Nicaraguan held notes of a darker coffee, with tobacco and bitter cocoa being prominent over the other flavors of cherry, walnut, sugar and grass. The tea is free leaf. Thus, it seems that either SteamDot believes in a darker roast spectrum or I hit their shop on an off day. Yet despite my darker-then-expected drinks, don't write off SteamDot; the cafe is gorgeous and it has the tools to be a superb place. Give it a try if you're in town.